Asciidoctor PDF is a native PDF converter for AsciiDoc. It bypasses the requirement to generate an interim format such as DocBook, Apache FO, or LaTeX. Instead, you can use it to convert directly from AsciiDoc to PDF. Its aim is to take the pain out of creating PDF documents from AsciiDoc. All that’s needed is Ruby 2.3 or better and a few Ruby gems, which we explain how to install in the next section. Make sure this command reports a Ruby version that’s at least 2.3. If so, you may proceed. Asciidoctor assumes you’re using UTF-8 encoding. To minimize encoding problems, make sure the default encoding of your system is set to UTF-8. If you’re using a non-English Windows environment, the default encoding of your system may not be UTF-8. As a result, you may get an Encoding::UndefinedConversionError or other encoding issues when invoking Asciidoctor. To solve these problems, we recommend at least changing the active code page in your console to UTF-8. Once you make this change, all your Unicode headaches will be behind you. You can get Asciidoctor PDF by installing the published gem. If you see the version of Asciidoctor PDF printed, you’re ready to use Asciidoctor PDF! Let’s grab an AsciiDoc document to distill and start putting Asciidoctor PDF to use. If you don’t already have an AsciiDoc document, you can use the basic-example.adoc file found in the examples directory of this project. It’s time to convert the AsciiDoc document directly to PDF. You’ll need the rouge gem installed to run this example since it uses the source-highlighter attribute with the value of rouge. Converting to PDF is a simple as running the asciidoctor-pdf script using Ruby and passing our AsciiDoc document as the first argument. The asciidoctor-pdf command just saves you from having to remember all those flags. That’s why we created it. When the script completes, you should see the file basic-example.pdf in the same directory. Open the basic-example.pdf file with a PDF viewer to see the result. The pain of the DocBook toolchain should be melting away about now. The layout and styling of the PDF is driven by a YAML configuration file. To learn how the theming system works and how to create and apply custom themes, refer to the Asciidoctor PDF Theme Guide. You can use the built-in theme files, which you can find in the data/themes directory, as examples. It’s possible to develop your own theme for Rouge. Refer to the Asciidoctor PDF Theme Guide for details. Asciidoctor can process the full range of characters in the UTF-8 character set. That means you can write your document in any language, save the file with UTF-8 encoding, and expect Asciidoctor to convert the text properly. However, you may notice that certain characters for certain languages, such as Chinese, are missing in the PDF. Read on to find out why and how to address it. If you’re writing in a non-Latin language, you need to use a dedicated theme that provides the necessary fonts. For example, to produce a PDF from a document written in a CJK language such as Chinese, you need to use a CJK theme. You can get such a theme by installing the asciidoctor-pdf-cjk-kai_gen_gothic gem. See the asciidoctor-pdf-cjk-kai_gen_gothic project for detailed instructions. Using a dedicated theme is necessary because PDF is a “bring your own font” kind of system. In other words, the font you provide must provide glyphs for all the characters. There’s no one font that supports all the worlds languages (though some, like Noto Serif, certainly come close). Even if there were such a font, bundling that font with the main gem would make the package enormous. It would also severely limit the style choices in the default theme, which targets Latin-based languages. Therefore, we’re taking the strategy of creating separate dedicated theme gems that target each language family, such as CJK. The base theme for CJK languages is provided by the asciidoctor-pdf-cjk project and a concrete implementation provided by the asciidoctor-pdf-cjk-kai_gen_gothic project that’s based on the kai_gen_gothic font. Of course, you’re free to follow this model and create your own theme gem that uses fonts of your choice. You can use the set attribute on the icon macro to override the icon set for a given icon. In addition to the sizes supported in the HTML backend (lg, 1x, 2x, etc), you can enter any relative value in the size attribute (e.g., 1.5em, 150%, etc). You can enable use of fonts during PDF generation (instead of in the document header) by passing the icons attribute to the asciidoctor-pdf command. Icon-based fonts are handled by the prawn-icon gem. To find a complete list of available icons, consult the prawn-icon repository. Images are resolved relative to the value of the imagesdir attribute at the time the converter is run. This is effectively the same as how the built-in HTML converter works when the data-uri attribute is set. The imagesdir is blank by default, which means images are resolved relative to the input document. If the image is an SVG, and the SVG includes a nested raster image (PNG or JPG) with a relative path, that path is resolved relative to the directory that contains the SVG. The converter will refuse to include an image if the target is a URI unless the allow-uri-read attribute is enabled via the CLI or API. If the image is an SVG and that SVG links to another image, the linked image will be resolved using the same rules as the original image. However, note that a width and height must be specified on the linked image or else the SVG library will fail to process it. The display width of the image as an absolute size (e.g., 2in), percentage of the content area width (e.g., 75%), or percentage of the page width (e.g., 100vw). If a unit of measurement is not specified (or not recognized), pt (points) is assumed. Intended to be used for the PDF converter only. The display width of the image as an absolute size (e.g., 2in) or percentage of the content area width (e.g., 75%). If a unit of measurement is not specified, % (percentage) is assumed. If a unit of measurement is recognized, pt (points) is assumed. Intended to be used for print output such as PDF. Accepts the same values as pdfwidth. Only applies to block images. The unitless display width of the image (assumed to be pixels), typically matching the intrinsic width of the image. If the width exceeds the content area width, the image is scaled down to the content area width. If you don’t specify one of the aforementioned width settings, the intrinsic width of the image is used (the px value is multiplied by 75% to convert to pt, assuming canvas is 96 dpi) unless the width exceeds the content area width, in which case the image is scaled down to the content area width. The image is always sized according to the explicit or intrinsic width and its height is scaled proportionally. The height of the image is ignored by the PDF converter unless the height of the image exceeds the content height of the page. In this case, the image is scaled down to fit on a single page. If you want a block image to align to the boundaries of the page (not the content margin), specify the align-to-page option (e.g., opts="align-to-page"). This is most useful when using vw units because you can make the image cover the entire width of the page. Images in running content also support the fit attribute. If the value of this attribute is contain, the image size is increased or decreased to fill the available space while preserving its aspect ratio. If the value of this attribute is scaled-down, the image size is first resolved in the normal way, then scaled down further to fit within the available space, if necessary. Page background images are automatically scaled to fit the bounds of the page. Any explicit sizing is ignored for those images. The pdfwidth attribute is the recommended way to set the image size for the PDF output. This attribute is provided for two reasons. First, the fixed-width canvas often calls for a width that is distinct from other output formats, such as HTML. Second, this attribute allows the width to be expressed using a variety of units. In all cases, the width is converted to pt. If you want to scale all block images that don’t have a pdfwidth or scaledwidth attribute specified, assign a value to the image_width key in your theme. The viewport width unit (i.e., vw) is not recognized in this context. The image will be scaled down, if necessary, to fit the width and height of the content area. Inline images do not currently support a default width controlled from the theme. If the resolved height of the image is less than or equal to 1.5 times the line height, the image won’t disrupt the line height and is centered vertically in the line. This is done to maximize the use of available space. Once the resolved height exceeds this amount, the height of the line is increased (by increasing the font size of the invisible placeholder text) to accommodate the image. In this case, the surrounding text will be aligned to the bottom of the image. If the image height exceeds the height of the page, the image will be scaled down to fit on a single page (this may cause the image to advance to the subsequent page). Asciidoctor PDF uses prawn-svg to embed SVGs in the PDF document, including SVGs generated by Asciidoctor Diagram. Actually, it’s not accurate to say that prawn-svg embeds the SVG. Rather, prawn-svg is an SVG renderer. prawn-svg translates an SVG into native PDF text and graphic objects. You can think of the SVG as a sequence of drawing commands. The result becomes indistinguishable from other PDF objects. What that means for text is that any font family used for text in the SVG must be registered in the Asciidoctor PDF theme file (and thus with Prawn). Otherwise, Prawn will fallback to using the closest matching built-in (afm) font from PDF (e.g., sans-serif becomes Helvetica). Recall that afm fonts only support basic Latin. As we like to say, PDF is bring your own font. If you’re using Asciidoctor Diagram to generate SVGs to embed in the PDF, you likely need to specify the default font the diagramming tool uses. Let’s assume you are making a plantuml diagram. You can choose any font name that is registered in your Asciidoctor PDF theme file. When using the default theme, your options are "Noto Serif", "M+ 1mn", and "M+ 1p Fallback". Clear the cache of your diagrams and run Asciidoctor PDF with Asciidoctor Diagram enabled. The diagrams will be generated using Noto Serif as the default font, and Asciidoctor PDF will know what to do. The bottom line is this: If you’re using fonts in your SVG, and you want those fonts to be preserved, those fonts must be defined in the Asciidoctor PDF theme file. In order to embed an image into a PDF, Asciidoctor PDF must understand how to read it. To perform this work, Asciidoctor delegates to the underlying libraries. 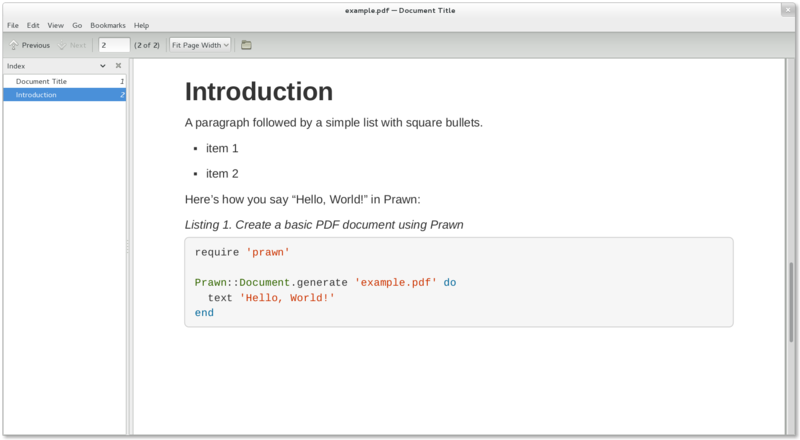 Prawn provides support for reading JPG and PNG images. prawn-svg brings support for SVG images. Without any additional libraries, those are the only supported image file formats. If you need support for additional image formats, such as GIF, TIFF, or interlaced PNG—​and you don’t want to convert those images to a supported format—​you must install the prawn-gmagick Ruby gem. prawn-gmagick is an extension for Prawn based on GraphicsMagick that adds support for all the image formats recognized by that library. prawn-gmagick has the added benefit of significantly reducing the time it takes to generate a PDF containing a lot of images. The prawn-gmagick gem uses native extensions to compile against GraphicsMagick. This system prerequisite limits installation to Linux and OSX. Please refer to the README for prawn-gmagick to learn how to install it. Once this gem is installed, Asciidoctor automatically switches over to it to handle embedding of all images. In addition to support for more additional image file formats, this gem also speeds up image processing considerably, so we highly recommend using it if you can. In order to insert a rendered equation into the PDF, the toolchain has to parse the equations and convert them to a format the PDF writer (Prawn) can understand. That typically means converting to an image. The recommended solution is an extension named Asciidoctor Mathematical, which we’ll cover here. Another solution still under development uses Mathoid to convert STEM equations to images. Mathoid is a library that invokes MathJax using a headless browser. That prototype can be found in the Asciidoctor extensions lab. Asciidoctor Mathematical is an extension for Asciidoctor that provides alternate processing of STEM blocks and inline macros. After the document has been parsed, the extension locates all the STEM blocks and inline macros, converts the equations to images using Mathematical, then replaces them with image nodes. Conversion then proceeds as normal. Asciidoctor Mathematical is a Ruby gem that uses native extensions. It has a few system prerequisites which limit installation to Linux and OSX. Please refer to the installation section in the Asciidoctor Mathematical README to learn how to install it. Refer to the README for Asciidoctor Mathematical to learn about additional settings and options. Asciidoctor PDF does not support arbitrary passthrough content. While the basebackend for the PDF converter is html, it only recognizes a limited subset of inline HTML elements that can be mapped to PDF (e.g., a, strong, em, code, ). Therefore, if your content contains passthrough blocks or inlines, you most likely have to use a conditional preprocessor to skip them (and make other arrangements). Certain blocks are rendered with a shaded background, such as verbatim (listing, literal, and source), sidebar, and example blocks. In order to calculate the dimensions of the shaded region, Asciidoctor PDF has to “dry run” the block to determine how many pages it consumes. While this strategy has a low impact when processing shorter blocks, it can drastically deteriorate performance when processing a block that spans dozens of pages. As a general rule of thumb, you should avoid using shaded blocks which span more than a handful of pages. Verbatim blocks often have long lines that don’t fit within the fixed width of the PDF canvas. And unlike on the web, the PDF reader cannot scroll horizontally to reveal the overflow text. Therefore, the long lines are forced to wrap. Wrapped lines can make the verbatim blocks hard to read or even cause confusion. To help address this problem, Asciidoctor PDF provides the autofit option on all verbatim (i.e., literal, listing and source) blocks to attempt to fit the text within the available width. When the autofit option is enabled, Asciidoctor PDF will decrease the font size until the longest line fits without wrapping. The font size will not be decreased beyond the value of the base_font_size_min key specified in the PDF theme. If that threshold is reached, lines may still wrap. The print dialog doesn’t understand the page numbers labels (which appear in the running content). Instead, it only considers physical pages. Therefore, to print a range of pages as they are labeled in the document, you need to add the number of front matter pages (i.e., the non-numbered pages) to the page number range in the print dialog. For example, if you only want to print the first 5 pages labeled with a page number (e.g., 1-5), and there are 2 pages before the page labeled as page 1, you need to add 2 to both numbers in the range, giving you a physical page range of 3-7. That’s the range you need to enter into the print dialog. Asciidoctor PDF supports generating an index catalog that itemizes all index terms defined in the document, allowing the reader to navigate the document by keyword. To get Asciidoctor PDF to generate an index, simply add an level-1 section flagged with the index style near the end of your document. The converter will automatically populate the catalog with the list of index terms in the document, organized by first letter. You can use any text you want for the title of the section. The only restriction is that no index terms may be defined below this section. Although the catalog is generated automatically, you have to mark the index terms manually. However, you could use an extension, such as a TreeProcessor, to automatically mark index terms. Asciidoctor PDF also provides a shell script that invokes GhostScript (gs) to optimize and compress the generated PDF with minimal impact on quality. You must have Ghostscript installed to use it. The command will generate the file example-optimized.pdf in the current directory. The optimize-pdf script relies on Ghostscript >= 9.10. Otherwise, it may actually make the PDF larger. Also, you should only consider using it if the file size of the original PDF is > 5MB. If a file is found with the extension .pdfmark and the same rootname as the input file, it is used to add metadata to the generated PDF document. This file is necessary to preserve the document metadata since Ghostscript will otherwise drop it. That’s why Asciidoctor PDF always creates this file in addition to the PDF. To test a pull request (PR), you first need to fetch the branch that contains the change and switch to it. The steps below are covered in detail in the GitHub help. Make sure you replace the number with the number of the PR you want to test. Asciidoctor PDF was written by Dan Allen and Sarah White of OpenDevise Inc. on behalf of the Asciidoctor Project. Copyright © 2014-2019 OpenDevise Inc. and the Asciidoctor Project. Free use of this software is granted under the terms of the MIT License. For the full text of the license, see the LICENSE file. Refer to the NOTICE file for information about third-party Open Source software in use.